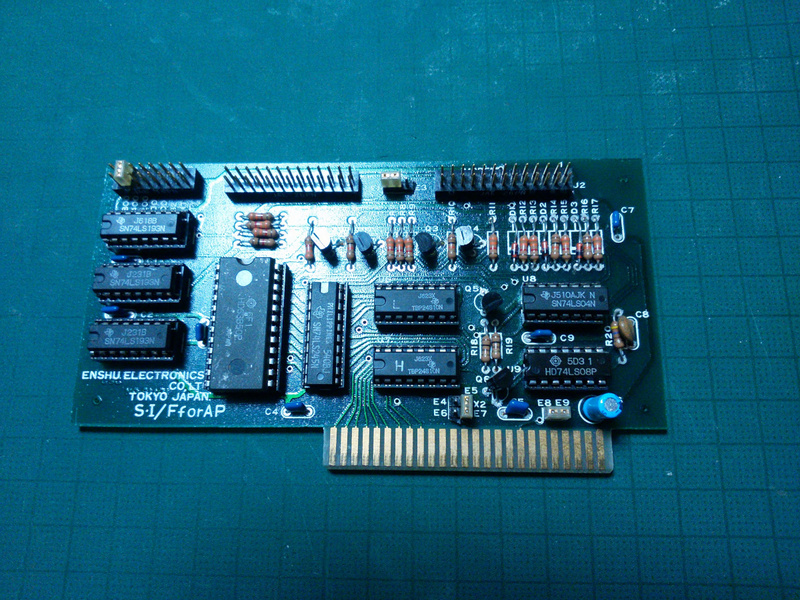 The attached picture is a serial interface card sold in Japan about 30 years ago. I guess it is probably a clone. I would like to know the details if the original is known. Please let me know if anyone knows. There is a 6850 ACIA, 256 Byte of ROM, but no driver chips for V.28. I think that V.28 levels are done in a discrete way by transistors. I have this card, but I do not even know how to initialize it. I found the manual with your comment, I will consider how to install and initialize this card. I would expect the card to work similar to the old serial standard ... Meaning you would use the PR#<slot> command to output data serially and the IN#<slot> command to read data. If you can successfully make a loop-back connection (looks like you can according to your photo) you should be able to use use the PR#x and the IN#x to check functionality of the board. I will prepare to make a loop-back test. There is some jumper connectors on the card as shown in the picture, so I need to consider the setting of the jumper cap fisrt. I think that this setting can be determined from the correspondance with the system bus.